Department of Pharmacognosy, Siddha Central Research Institute, Arumbakkam, Chennai 600106, India. Correspondence to: CITE THIS RESEARCH AS Balbhadra S, Ganti BY, Sunil Kumar KN. Monographic Analysis of Apamarga Kshara Preparation Methods Mentioned in Five Different Ayurvedic Texts. J Ayu Med Sci 2018;3(1):326-32. Apamargakshara (AK) is an alkali extracted from the water soluble ash of Apamarga (Achyranthes aspera Linn.) Panchanga (whole plant) and used as one of the major ingredient in the Kshara Sutra Nirmana, which is mainly used for treating Arshas and Bhagandara also has wide therapeutic uses in Shwasaroga, Udarashoola, Shwitra, Ashmari, Karnaroga etc. But, the typical processing technique involved in the preparation of Kshara differs according to various authors, by the ratio of water added to ash, soaking time, folds of cloth and number of times of filtration. In the present study preparation of AK was performed as per 5 different methods and analytical study was carried out. AK was prepared according to different references like Ayurveda Sara Sangraha (sample A), Rasa Tarangini (sample B), Sharangadhara samhita (sample C), Ayurveda Prakasha (sample D), SushrutaSamhita (sample E) followed by analytical standardisation employing tests like oganoleptic, physico-chemical and elemental analysis. Sample A fulfills the standards criteria, pH value - strongly alkaline in all samples, whereas akanity was more in sample A, SEM-EDAX results revealed - presence of other components i.e CaCO3, SiO2, Na (Albite), K (KCl) and Ca (wollastonite) and most of the compounds are highest in sample A. Considering alkalinity, quality and economy method prescribed in Ayurveda Sara Sangrahacould be considered as better among the five methods. Ayurveda cannot remain confined to the use of conventional, conservative norms of medication. It has to accept the new challenges and be prepared to answer the queries of the modern man who would have a right to know about the drug he uses. To meet this new trust of questioning, standard for drugs in Indian Systems of Medicine is mandatory. An Ayurvedic preparation of medicine involves multi-step procedures of many plants and mineral drugs. The complex composition increases the difficulties of standardization and subsequently quality control of the finished product becomes more complex. It is therefore essential that proper documentation and standardization of process, based on the botanical and chemical characterization of individual drug material must be done. Analytical study is the application of a process or a series of processes in order to identify and quantify a substance, the components of a solution or mixture, or the determination of the structures of chemical compounds and elements. Having ascertained the nature of the constituents of a given sample, the analyst determines how much of each component or of specified components are present. Such determinations lie within the realm of quantitative analysis. Each and every drug substance has its own physical and chemical characteristics which help for separating it from other closely related drug. Hence, physico-chemical analysis provides the objective parameters to fix up the standards for quality of raw drugs as well as finished products. Analytical study of a drug might also helps to interpret its pharmacokinetics and pharmacodynamics. The drugs which are manufactured should be well understood and interpreted in the light of modern chemistry to provide proper scientific background. With the help of analytical studies, it is possible to standardize the plant and drug, thus significantly recognize about the genuineness of finished product, which is the need of present era. Hence, qualitative and quantitative analysis of drugs by using the modern techniques and instruments of the science becomes essential at present. In present study an attempt was made to standardize the method of preparation of Apamarga Kshara (AK) on the basis of yield, quantity and economy by employing various analytical parameters for in-process material and finished product. AK was prepared by different methods mentioned in Ayurvedic classics, with variation in proportion of water, duration of soaking ash and filtration pattern etc. The plant sample was procured from local village of Hassan in Karnataka and authenticated pharmacognistically before pharmaceutical study. The panchanga(whole plant) of Apamarga was taken, dried properly in sun light and burnt and ash was prepared, after preparing the ash it was processed as per five different methods mentioned in Ayurveda Sara Sangraha (sample A), Rasa Tarangini (sample B), Sharangadhara Samhita (sample C), Ayurveda Prakasha (sample D), Sushruta samhita (sample E) (Table 1). The analysis of AK samples (A to E) was carried out by using different organoleptic, Physico-chemical and elemental analyses (Table 2 and 3). The Physical tests like organoleptic evaluations, pH analysis, loss on drying, total ash, acid insoluble ash, water soluble ash, refractive index, and specific gravity was done in SDM Centre for Research in Ayurveda and Allied Sciences, Udupi, Karnataka. The chemical parameters like qualitative analysis and quantitative analysis with percentage of sodium, potassium, magnesium, calcium, sulphate, alkanity CaCO3, carbonate and bicarbonate samples was done in National Institute of Technology Karnataka, Surathkal. The Elemental analysis and Particle size estimation of Kshara samples was done through SEM-EDAX at Manipal Institute of Technology, Manipal Karnataka. Determination of foreign matter, organoleptic characters, loss on drying at 105°C, total ash, acid insoluble ash, water soluble ash, refractive index, specific gravity and pH was done as per standard methodology. Take known weight of sample and dissolve in water (specific amount) and add HCL (1:1 ratio), add 3ml of nitric acid, keep for digestion in hot plate. After digestion filter the sample through No.1 filter paper and make up to known volume. From this solution K, Na and Ca were detected by flame photometry. Standard magnesium solution from magnesium chloride was prepared and used as the stock solution to prepare 2ppm, 4ppm and 8 ppm standard solutions. The standards and samples were loaded in the atomic adsorption spectrophotometer and the observed values noted. Known volume of filtered sample was taken in a beaker. Acidified with 2-3 ml HCl and add 20ml of 10% BaCl2. Warmed for 30 minutes and filtered through G4 crucible. Pipetted out 50 ml of sample in a conical flask. Added 2-3 drops of phenolphthalein as an indicator & titrate against 0.01N HCL till get colorless and continue by adding methyl orange 2-3 drops and titrate against 0.01N HCL. End point orange to red. Total alkalinity is the amount of acid required to lower the pH of solution to 4.5, it can be divided in various species if inflection points are known. It was done following standard methodology. Twog of AK was dissolved in 0.5ml of distilled water and kept for 1 hour after that 3 drops of sample is put over 1cm glass slides and is heated in bunsen burner, to remove the moisture completely. Then the slides are placed over holder containing screws with the help of double sided black carbon tape, holder is placed and fixed in sample chamber. The chamber was closed and command is given to create vacuum around the chamber. The electron beam is focused on to the sample surface kept in vacuum by electromagnetic lenses. The beam is then scanned over the surface of sample. The scattered electron is then fed in to detector. The colour of apamarga ash was grey in colour, due to complete burning of drug without leaving any unburnt traces. The odour was characteristics (Table 4, 5). Taste of ash was salty this may be due to presence of alkaline content in it. Appearance was in powder form due to complete burning and evaporation of moisture. Whereas the pH of the ash was 10.5 which indicate the transformation of qualities i.e. apamarga raw drug shows mild acidic character but soon after burning (ash) it turns to alkaline, that indicates the presence of water soluble basic kshara, and the transformation of qualities occur after burning. The colour of Ksharodaka before filtration was greyish black and after filtration the all samples colour changes to light yellow colour, resembling Gomutra (cow’s urine colour) and transparent this colour changes occur due to repeated filtration for several times with cloth due to reduction in carbon particles during filtration makes Ksharodaka transparent. Taste was saline which indicates presence of inorganic salts like KCl, Na(sodium), K(potassium). Sample A, B and E was transparent in nature(Table 6 and 7); this is due to absence of particle because of repeated filtration it will help to remove the fine carbon particles during filtration. In sample C and D presence of mild particle was found this may be due to 1 time filtration. Ksharodaka was very slimy to touch, the same reduced after repeated filtration for 7 times and it was very less in sample E this may be due to 21 times repeated filtration with cloth helps in reduction of sliminess. But sliminess was more in case of sample A, this may be due to more contact time of water and ash (72 hours). Whereas sliminess was also present in sample C and D, due to 12 hours and 24 hours of soaking and single time filtration. The alkaline solutions are slippery or soapy to touch, due to the saponification of fatty substance on the surface of skin. The pH of Ksharodaka of sample A and B, was 10 whereas sample C, D and E pH was 10.5 this may depend on the amount of water added which changes the concentration of liquid and alteration of pH. Also the changes in pH can depend on soaking time, number of times of filtration and folds of cloths used for filtration. There is mild alteration of 0.5 in the changes in pH of sample C, D and E, but the alkaline pH indicates the presence of water soluble basic Kshara. Colour of AK of all samples was whitish (Table 8) this may be due to the evaporation of water portion during boiling and the sediments which possess the white colour. The taste was pungent and salty because of the presence of inorganic salts like KCl, Na (Sodium), and K (Potassium). Odour was characteristic and pungent. In touch,Kshara was powder form and slimy nature, may be due to its hygroscopic nature. Loss on drying indicates the presence of moisture content in the drug, the moisture content is less in succeeding order, Sample E > sample C > sample D > sample A > sample B. Higher % of moisture content indicates the sample will spoil faster and reduced in shelf life. Sample B and A has less moisture content so it can be taken as it will not spoil faster. Whereas Sample E has more moisture content this may be due to long time exposure to atmospheric condition during preparation. The total ash figure is of importance and indicates to some extent the amount of care taken in the preparation of the drug. In the determination of total ash values the carbon must be removed at aslow temperature (450°C) as possible because alkali chlorides, which may be volatile at high temperature, would otherwise be lost. This indicate the amount of ash content present in the sample, more will be the content of ash in the sample more will be the presence of alkaline matter in the sample, Sample A > sample B > sample D > sample E > sample C. This indicates sample A has more content of Ash in it is due to more contact time of water with ash (72 hrs) so the more extraction can occur, whereas sample B comes next to that this may be due to continuous maceration the more ash can be extracted. But all the samples have almost similar ash value with minute difference. Acid insoluble ash was carried out to evaluate the percentage of insoluble inorganic content of the sample in dilute acid. Since a drug must first pass into solution before it can be absorbed, so the acid insoluble ash test for drug is therapeutically very important. It is intended to provide a step towards the evaluation of the physiological availability of the drug. Sample A, B > sample C > sample E > sample D. Kshara is prepared by dissolving this ash in water and after filtering dried by the heat, in this process, an insoluble substance like silica is being separated by the filtration and soluble substances like Potassium and Sodium remain in the solution. Sample A and B has more acid insoluble ash value may be due to the presence of some insoluble silicates. Water soluble ash indicates the percentage of solubility of contents of the sample soluble in water. Also the solubility of ash finds out the impurities. Sample A > sample B > sample D > sample C > sample E, All the samples were almost soluble in water. Refractive index of a substance is defined as the ratio of the velocity of light in vacuum or air, to that in the substance. Refractive index is a fundamental property of a substance which helps to identify a substance confirms its purity and measures its concentration. It is directly proportional to density (consistency of the media and solutes present in the media). Sample B > sample A > sample E > sample D > sample C, Refractive index of all five samples was almost similar with meager difference; this variation may be due to the different proportion of water used during preparation. Specific gravity is the weight for a given volume of substance when compared with same amount of water at given temperature. It indicates the presence of solutes in a solvent. Here the solutes refer to the extracted active principles of Apamarga. Sample B > sample E > sample A > sample D > sample C, Here almost all the samples have the similar specific gravity but sample C has less compared to all; this may be due to decanting of supernatant liquid. The pH Value of an aqueous liquid may be defined as the common logarithm of the reciprocal of the hydrogen ion concentration expressed in gram per liter. The acidity or alkalinity of a solution has a profound influence on the decomposition of drug. If it is very acidic or less alkaline there will be more decomposition of the drug. pH influences the rate of oxidation. When the pH is low is less readily oxidized. It shows drug is alkaline in nature due to presence of alkali salts. Absorption, efficacy, and irritability of a medicine will depend on the pH value also. The pH value of all the sample range between 10 - 10.5 this shows the alkaline character of drug. Almost all the samples have similar pH. The mild alteration can be observed because of water concentration during the time of soaking, filtration times and folds of cloth. aqueous solution to neutralize an acid. It’s actually related to pH of a solution but measures different property. The Alkalinity of a solution is a measure of how strong the bases are in solution, the alkalinity of Apamarga samples vary, more the alkalinity more the substance will be alkaline in nature and strong base. The order of alkalinity in phenolphthalein was as follows: sample B > sample C > sample A > sample D > sample E. The same in methyl orange was as follows: sample A > sample E > sample D > sample C > sample B. Here in Apamargakshara samples the phenopthelene alkali (1/2 carbonate + hydroxide) is more in sample B. Whereas the methyl orange (total alkalinity) presence more in sample A but minute difference with sample E this may be due to duration of soaking and filtration pattern and the folds of cloth. Also sulphate and carbonates are less in sample A compared to other samples this may be due to method of preparation (Table 9). 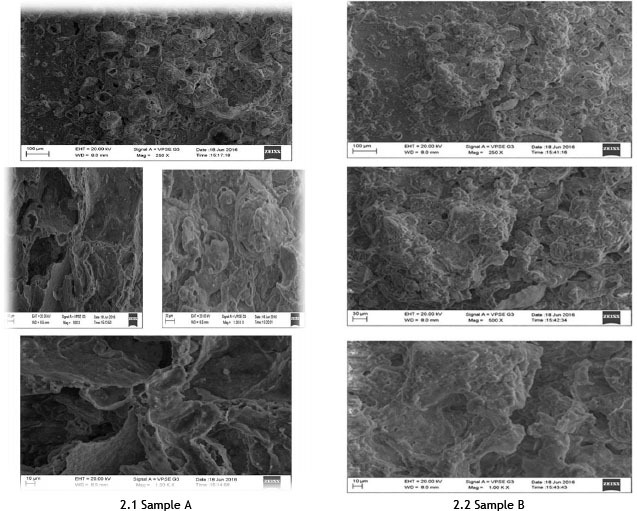 In this study other elements were analyzed with the help of scanning electron microscope - energy dispersive X- Ray spectroscopy (SEM-EDAX), and these was compared with standards. 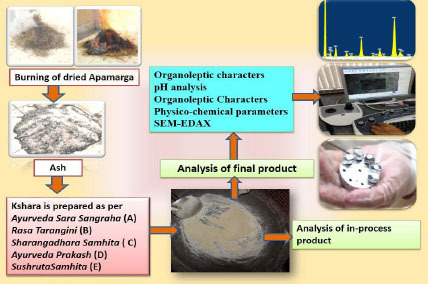 Almost all the samples of Apamargakshara have similar elements but there is meager difference in the quantitative analysis, of all the samples of Apamargakshara it’s mainly due to proportions of Ash and water ratio and soaking time. For better understanding of different elements they are compared with the given standards and the other elements in Apamargakshara different samples is identified. Almost all the samples have similar readings. But sample A contains the major amount of trace elements, Alkaline substance contain Na, K, Mg, as a main elements but the different samples of Apamargakshara also contains CaCO3, SiO2, Na (Albite), MgO, KCl, K, Ca (Wollastonite) Fe as other elements (Figure 1 and 2). Na (Albite) it is sodium rich mineral of Fieldspar group, typically occurring in silicates rocks. Ca (Wollastonite): it is industrial minerals comprised chemically of calcium, silicon and oxygen. 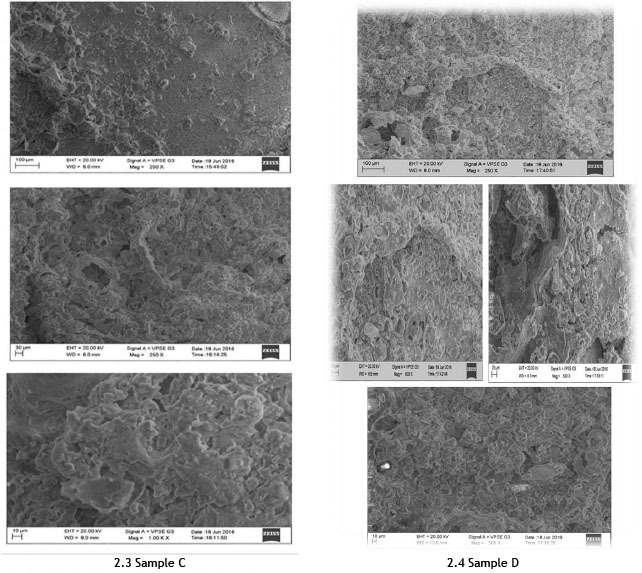 The SEM when used along with EDAX it gives qualitative as well as Quantitative results along with topographic image of sample (Table 11 and Graph 1). Apamargakshara mainly contains chemical constituents such as CaCO3, Na, KCl, oxides (SiO2), Ca and Mg as major elements and Fe as traces. 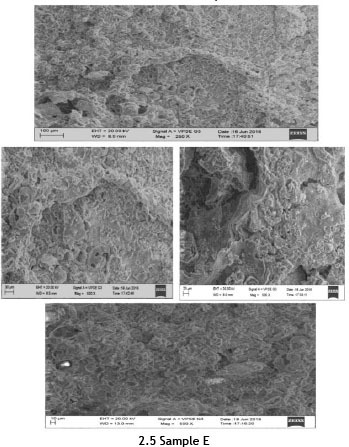 The compound silicon dioxide (as its present in the silicone gel also which is extensively used for scars and wound healing), it increases the hydration of stratum corneum and thereby facilitates regulation of fibroblast production which allows skin to breath (results in softer and flatter scars). It also protects the scarred tissue from bacterial invasion and increases the growth of fibroblast, Magnesium (Mg) - Required for almost all stages of wound healing. Calcium prohibits bacterial reproduction on wound surfaces Topical application of calcium increases pro epithelialisation of the wound. And it reacts with magnesium ions on the surface of the site to form chelates (removes slough) which have antibiotic properties. Thus the presence of these elements could be beneficial in the process of healing. 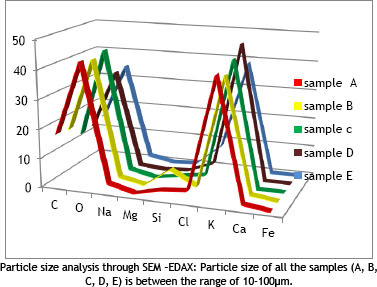 Particle size analysis through SEM -EDAX: Particle size of all the samples (A, B, C, D, E) is between the range of 10-100μm. A similar analytical study on Apamargakshara samples prepared in presence of Jala and Gomutra showed that both the samples have peculiar characteristics which are in accordance with the properties of Kshara. The study proved that pharmaceutical processing of the raw drugs imparts characteristic properties to the formulation which are evident by the physico-chemical analysis of the two samples. Among all the samples considering yield, alkalinity, quality (presence of elements) and economy Sample A could be considered as better method among the five methods of Apamargakshara preparation. The second best method to prepare sample B out performs with respect to its quality and economy. Authors thank the SDM Center for Research and Allied Sciences, Udupi; MIT Manipal, and NITK suratkal for helping to complete the research work. Dr. Shristi Balbhadra done literature survey, data acquisitionfrom various sources, carried out research work design of manuscript. Dr. Basavaraj Y Ganti monitered the research work, intellectual content and editing of manuscript. Dr. Sunil Kumar KN contributed to data analysis, conceptualization of the topic and manuscript editng. Anonymous , author. The Ayurvedic Pharmacopoeia of India3rd edition. New Delhi: Department of AYUSH, Ministry of Health and Family Welfare, Government of India. Part II Vol. II;; p. 50–51. 226.